Thin women arching backs, kicking legs, and pointing feet—“It truly had nothing to do with the revolution,” says Dr. Gang Yue, a professor of Chinese studies at UNC Chapel Hill. Through documentary video, Chinese spoken word (with imperfect subtitle translation to English) and dance movement, RED highlights the irony of China’s 1964 ballet The Red Detachment of Women. During RED’s 80-minute performance at the Asia Society in November, Chinese modern dance troupe Living Dance Studio’s four female performers dance and lecture on multigenerational experiences surrounding the 1964 ballet. 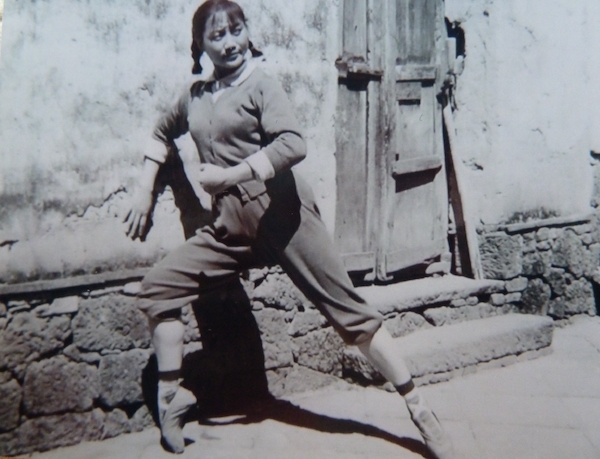 In her youth, sixty-three-year-old Liu Zhuying danced Red Detachment in a regional troupe, performing in dingy classrooms and on muddy farm grounds. In measured words and small steps that charmingly echo her previous athleticism, Ms. Zhuying describes that she never grew tall enough to leave her 18th spot in the corp de ballet’s height-ordered line up, even though she was technically proficient enough to dance the lead role. Red Detachment is about an imprisoned woman who escapes to join a Red Army camp of women. In the rank-and-file training and battle scenes, soldiers and proletariat are the united good. (And, weirdly, they’re aptly portrayed by classically trained ballet dancers. Only women performing as swans and soldiers can achieve such exactitude.) Wen Hui, RED’s choreographer and one of the performers, explains that the most heroic heroes in the ballet are most centrally staged and brightly lit (as per the aesthetic principles outlined by Mao Zhedong’s wife, in common with the seven other “model theater” operas and ballets she sanctioned). Ms. Hui says that RED’s four dancers will not follow the prominences principle, and they subvert traditional staging to the point of literally walking into and leaning against the backdrop, distorting the projected video. The first time two of the dancers do this, the projection is zoomed onto a book. It looks as if the dancers are miniature people exploring—evening getting hit by—the flipping pages. The company’s most striking member is 26-year-old Li Yuyao. Most dancers (of all genres) have a kind of active quietude when standing still onstage, achieved through an uplifted, outward gaze. Ms. Yuyao’s inward intention comes across as boredom. That is, until she starts moving, at which point it’s clear that her dancing is meant for world stages. She discusses her youth learning the eight points of the stage both in classical ballet training and even in Mongolian folk dancing. Her arms undulate and curve more gracefully than any ballerina swan wing I’ve ever seen. (And I’ve seen thousands). Had she been born 40 years earlier, she surely would have been recruited to perform Red Detachment. The sorrow RED’s dancers portray through their stories about the Cultural Revolution, its most famous ballet, and its aftermath isn’t matched by the dancers interviewed in the documentary video. One woman sticks out her chest proudly, chirping the memorized tunes and thrusting her arms up like the ballet’s female protagonist when she’s chained by adversaries. The very same dancer tells the story of when she was made to go back to rehearsals a month after giving birth. Her directors wanted her to get an injection so that she would stop lactating, but under physical hardship and stress, her body stopped making milk after three days later without the procedure. The regime and the dancer’s husband were at odds here. He threatened her and tried to stop her from going to rehearsals. As she tells the story, Ms. Yuyao demonstrates two hand movements: the feminine “orchid” fingers and the masculine splayed palm. It’s a microcosm of gender oppression displayed in one exquisite body. The flat hand viciously wraps around her neck and spins her, while the orchid strokes and waits and eventually tries to ripple free. In a Q&A session before RED, the show’s playwright says that the piece was completed in 2015, the 60th anniversary of the Cultural Revolution. She says that the company had to be careful about how they promoted and presented RED. In a final scene, all four dancers lean against the backdrop again, now covered with the red curtain, as a timeline of The Red Detachment of Women scrolls Star Wars-esque over their bodies. The last paragraph stops on this decade: the ballet has been staged 3,800 times since 2014, when the National Ballet of China revamped and toured the piece. RED’s final note seems to say: An oppressive regime lingers and rears as readily as a dancer’s muscle memory. And so the audience claps, in this decade and those bloodily passed.